Birth date and place 2 Apr 1829 Seagoe, Lurgan, Armagh, Ireland. Physical Description Height: 5 ft. 6 ins. Complexion: fair. Eyes: blue. Hair: fair. Marriage date and place 1857 Lurgan, Armagh, Ireland. Spouse Jane (Jayne) Eliza SMYTH b.1839, d.1915. Children Ann 1859, Northern Ireland. Emily Jane 1860, Northern Ireland. William Smythe 1862, Northern Ireland. Mary A. 1865, Murchison, Western Australia. Thomas James 1866, Geraldton, WA. Martha Alexandra 1871, Greenough, WA. Frederick George 1872, Greenough, WA. Miriam (Marion) Elizabeth1874, Greenough, WA. Eveline (Evaline) Gertrude 1878, Greenough, WA. Death date and place 6 Jul 1907 Georgina, WA. Burial date and place Jul 1907 Greenough Old Cemetery (Weslyan Section), Western Australia. Death Notices and Obituaries Geraldton Guardian 9 Jul 1907. 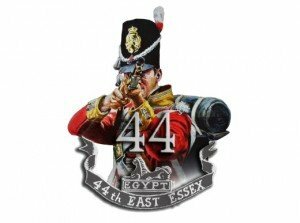 Regiment(s) 44th East Essex Regiment. Attestation date and place 2 Oct 1846 Lisburn, Antrim. Service/Campaigns Malta 2 years 11 months. Gibraltar 2 years 11 months. Promotions Private to Corporal 11 Mar 1855. Casualty/Medical Has very impaired action of left arm and is unable to exert any force with it, in consequence of a musket bullet having struck the upper arm just above the inner condyle and fracturing the bone obliquely – popped out on the dorsum of the arm (upper) about 5 inches above the point of the olecranon. The humerus has united in an oblique manner. Also a musket bullet popped under the integument of the R. side, for 8 inches in the course of the 9th rib. Wounds rec’d on June 18th /55 in an attack on the Redan. Request to Under Treasurer, Perth, Western Australia for Anderson to be medically examined. Click here for Dr. Maclachlan’s Medical Report 16 Feb 1859 [WO97 p. 1]. Discharge date and place 3 Jun 1856 Chatham. Length of Service 9 years 63 days. Post Discharge Residence Lurgan, Armagh. Post Discharge Pension District Newry (1856). 2nd Belfast (1860). Western Australia (1864). Pension Amount 1/3d. per diem. 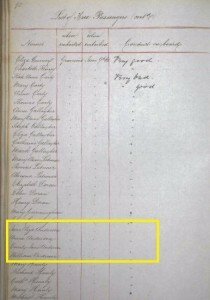 Refused increase in pension 22 Feb 1859. Increased to 24d. per diem 7 Mar 1907. Policeman: Appointed Constable 3 Feb 1866. Corporal 1 Feb 1871. Lance Sergeant 9 Dec 1873. Dismissed 31 May 1879. Police Transfers: Perth & Geraldton 1866. Gwalla Mines (later Northampton) 1869. Geraldton 1870. 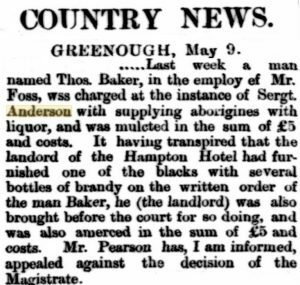 Greenough (Lockup Keeper) 1871. Dongara & Strawberry 1872/73. Greenough 1874. Fremantle 1878. Farmer at Whitton Farm, Walkaway. Land Grant/Purchase Whitton Farm, Walkaway – purchased. Misc. Newspaper Articles Inquirer & Commercial News 24 May 1876. John Milton Brenkley of Geraldton shared the biography of his ancestor, Thomas Anderson, with me in 2008. 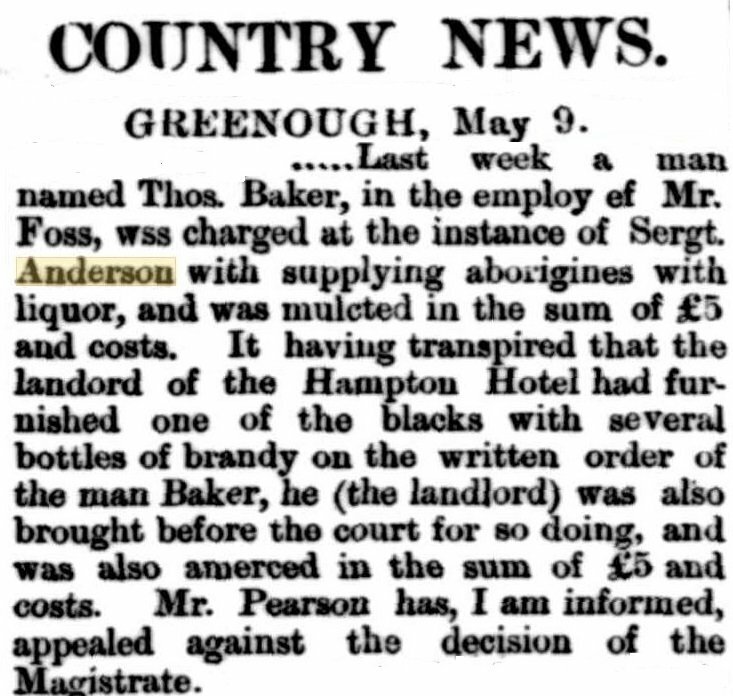 Some frequently used local resources appear to have attributed Thomas Anderson’s daughter Anna (born 1859) as the wife of Hugh Anderson – another convict guard on board the Merchantman. Mr Brenkley’s information and this page (above) of Dr William Smith, Surgeon Superintendent’s Journal of the voyage, dispel this notion entirely. Thomas Anderson travelled to Western Australia with his wife Jayne Eliza and their three children: Anna, Emily Jane and William Smythe.